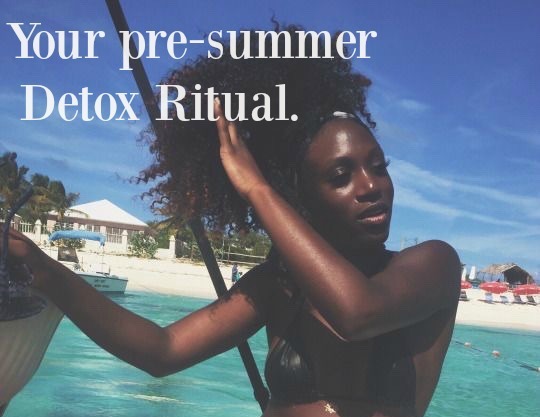 Your Pre-Summer Detox Routine | Clear Skin, Purge Toxins, & eliminate body odor. The warmer it gets, the more I suddenly have the urge to conduct a mini-detox. Based on some of the info I've read online, supposedly our circulation increases when temperatures rise. When it's cold, our body circulates blood inwards towards the organs to keep them warm. But, as it gets hotter, our circulation is rerouted to the skin, as a way to help keep us cool. But here's the thing, since the circulation process slows in the winter months, once things heat up, our body starts purging toxins through our skin. I noticed the phenomenon a few years ago after observing people with typically calm skin battling breakouts in the summer. Once I realized what was happening, I began this ritual of detoxing internally so all the excess sweating and oil production wouldn't lead to acne flare ups. The very first step in my pre-summer detox ritual will be to reincorporate lemon water into my regular routine. I'll tell you a story. Last year, I met a friend at a local social establishment almost on a daily basis. As soon as I sat down, before we started working, I asked the server for a lemon, cucumber water. While there, I would consume several glasses of room temp lemon water before heading home. Soon I got into the habit of drinking lemon water even when we didn't meet. Then, one day, I finished off a workout session on my mini trampoline and, before jumping into the shower, my other half came over and said something that I would never forget. Basically, he told me that my perspiration had a mild citrus scent. At first I was taken aback. But after a moment of reflection, I recalled all of the lemon water I'd consumed days prior. I'm not sure if there's any merit to this, but if drinking adequate amount of lemon water somehow influenced my natural scent, then I'm all for it. At first, I didn't know if he was being serious but after finding this testimony online, I knew I had stumbled onto something. "I have been suffering from very bad body odor all my life. I have to wash twice a day and use antiperspirants (which I am not so comfortable with). Then a friend told me about lemon water and it works wonders. First thing in the morning mix 2 tablespoons of lemon juice with a cup of water and drink. Make sure you don't have anything before it. Basically what it does is detoxes your liver so it has to be the first thing through your system. After a couple of days the odor was gone! No more antiperspirant! I do this everyday. If I miss a day, the odor returns. I have been doing this for about 8 months now and it is still just as effective." Typically lemon water results in more restroom breaks for me vs. drinking water alone. I figured this was part of the internal alkalizing process. But neutralizing body odor is an added bonus! When it heats up outside, I typically reach for light fragrances with citrus notes. You can imagine how excited I am about the possibility of recreating that effect all naturally. But wait, there's more. This is just Phase One of my pre-summer internal cleanse routine. I'll share phase II tomorrow. What also seems to have an effect is wheatgrass. Hi I will be trying this. So this is a silly question it's 2 tablespoons of lemon juice in how much water? 8oz of water or more? Actually, I didn't even measure. I basically enjoyed several cups of lemon infused water daily. Also, please check out my post of Chlorophyll water. It's a great alternative to lemon water for internal cleansing.